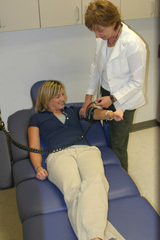 The NADS facility supports studies of varying lengths and complexities. The facility features separate and secure areas for study development, testing, and data collection. As participants arrive at our facility, they are greeted by a member of our staff and escorted to a private area for training and preparation. The participant preparation area is equipped for an array of evaluation and training procedures, including a secure medical room for research studies that require physical examinations, drug administration, or monitoring of participants’ biophysical systems. Simulator operations for NADS-1 and NADS-2 are overseen by operators and research staff from secure control centers. The NADS facility can host large groups in our conference room, which is outfitted with full telephone and video conferencing capabilities. Clients may also visit our facility during data collection and monitor the progress of their study through camera links between the simulator and the conference room. Our convenient location, near Interstates 80 and 380, provides easy access for participants not only from the Cedar Rapids and Iowa City areas, but also from as far away as Des Moines, Davenport, and Chicago. For studies that require participants to be recruited and transported to the facility from around the country, NADS is a short 15‐minute drive from the Eastern Iowa Airport and is located within minutes of several hotels. Enter your starting address, then click the "Get directions" button to get turn-by-turn driving directions to the NADS facility.